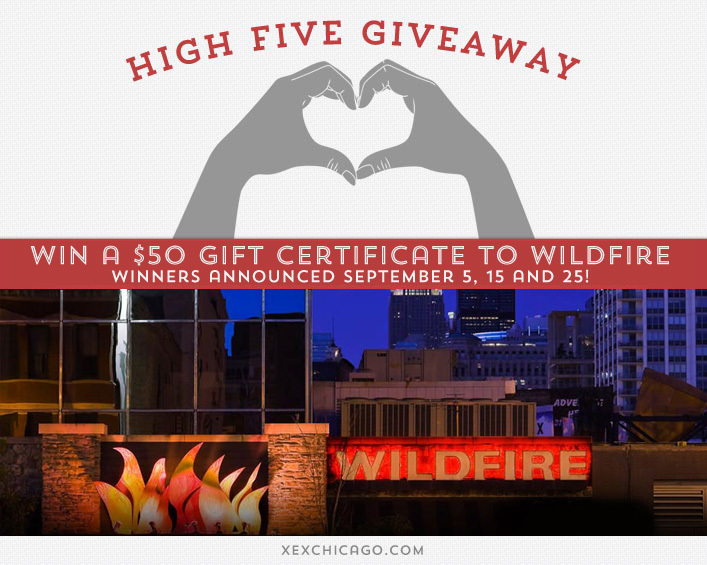 Win a $50 Gift Certificate to Wildfire, plus 20% off for everyone! We are doing something extra special this month. We’ve teamed up with Wildfire Restaurant and will be giving away three different $50 gift certificates to their fantastic restaurant in September. We’ll announce winners on the 5th, 15th and 25th of September. Update (September 5): Congratulations to AnnaLiese Quistgaard on winning the first of the three gift certificates to Wildfire! We still have two more gift certificates and will be giving them away on September 15th and 25th. Update #2 (September 15): Congratulations to William Draisey on winning the second of the three gift certificates to Wildfire! We still have one more gift certificate and will be giving it away on September 25. As an added bonus, all clients can enjoy a 20% discount at Wildfire from September 1-30! Simply click here for a coupon to print or show on your phone when you dine at Wildfire. Step back in time to when going out for dinner meant something really special. From the decor to the jazz music, Wildfire has the style and warmth that makes it perfect for celebrating with friends or a quiet evening for two. The extensive menu features broiled steaks and chops, wood-roasted seafood and roasted meats, all prepared in an open kitchen. Signature dishes include Horseradish Crusted Filet Mignon, Macadamia Nut Crusted Halibut, Wildfire Chopped Salad and Cedar Planked Salmon. So order a signature martini or one of our many wines by the glass, then sit back and enjoy the 1940s supper club experience of Wildfire. Wildfire is located at 159 West Erie Street, Chicago. Visit their website at www.wildfirerestaurant.com/chicago or call them at 312-787-9000 for more information. If you’re getting your hair colored, you shouldn’t wash it for how many days before your appointment? Now, just add a comment to this post with the right answer to be eligible to win! Winners will be announced on September 5, 15 and 25. Contest ends on 9/25/14. All individuals 21 and older are eligible, whether you are a client of XEX or not. Must be able to pick up the gift certificate at XEX, 35 West Wacker Drive, Chicago within 30 days of winning. Leaving a comment opts you in for the XEX email list, which is sent out 1-2 times per month. You may unsubscribe at any time.